DreadLab.co.uk is a small business based in Lincoln, England. 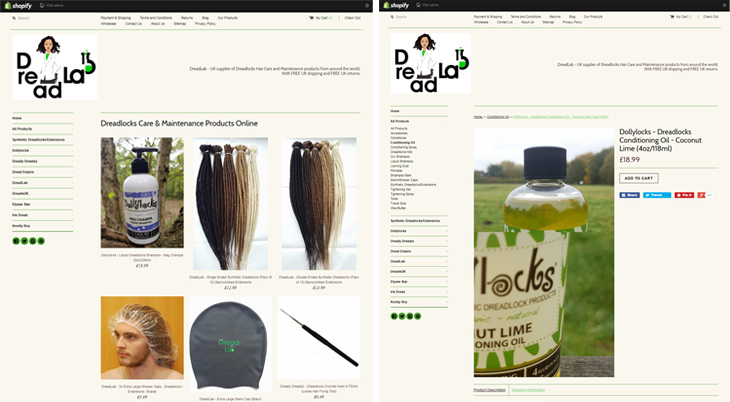 DreadLab offers dreadlocks hair care and maintenance products on their website at the best prices. They have been in business since the start of 2015 beginning on eBay and Amazon and continue to offer more exciting products regularly! Customer satisfaction drives DreadLab, so the goal was to build something that was not only familiar and easy to navigate for their loyal following, but also appealed to new customers who were just discovering DreadLab for the first time. The existing design was outdated and it needed a re-vamp, so customers have a better shopping experience. DreadLab’s old website came across as a little weathered with difficult navigation, minimal mobile optimisation and clunky product pages. An upgrade to the design aesthetics and overall feel of the site was required. DreadLab was also facing site & cart abandonment due to poor navigation paths. Furthermore, customers who ventured into the site to explore and be inspired by what the site had to offer had a very difficult time. For a brand built around people, they wanted to provide inspirational navigation paths to reflect the dedication to superior use experience. The website received a total responsive overhaul, incorporating a more upscale feel using modern fonts, icons, and other UI/UX elements that better spoke of the DreadLab brand. The website was incorporated with a global navigation menu that allowed customers to reach their desired product category in just a click! An advanced filtering option on all the category pages that allowed customers to accurately infer the available product range, compare those products, filter and sort them, examine key attributes of relevant products, and ultimately determine which products are of relevance and which are not. Furthermore, the website was empowered with an global search bar that instantly gives results when a customer starts typing, making the process of finding the product needed quicker. Apart from this, a scoller displaying all the brands that are stocked under DreadLab were also displayed, enabling customers to identify a desired brand and view all items under that brand. 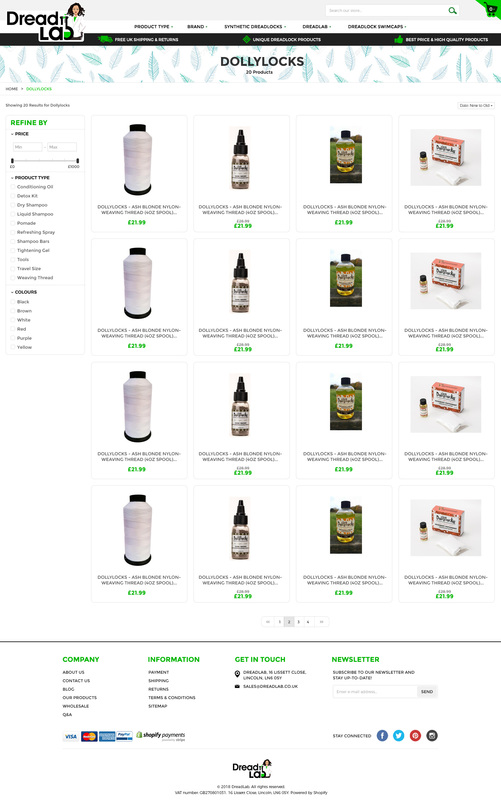 In order to appeal to new customers who were just discovering DreadLab, the website’s homepage was leveraged to offer guidance by displaying the featured products, newly arrived products, and an Instagram section displaying the images of DreadLab’s loyal customers. 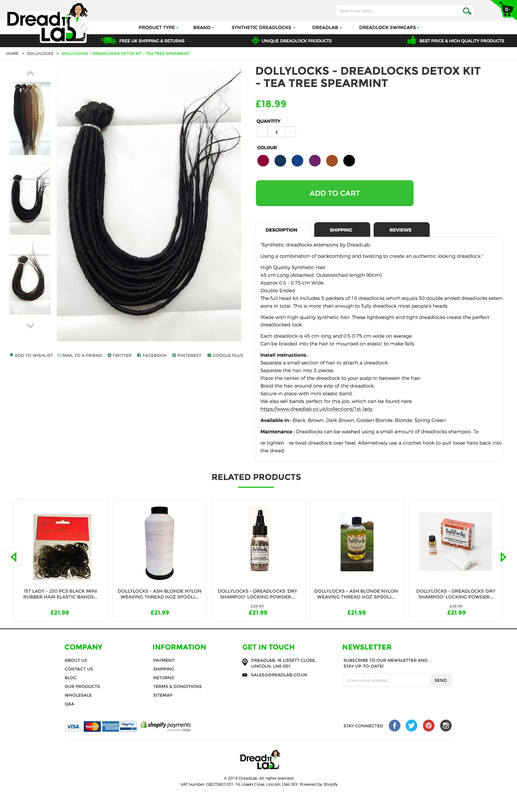 The new website is a dramatic improvement on the last and the solution created was one that allowed DreadLab’s customers to view the expert description of each product and view the prices, delivery options and estimated delivery dates seamlessly. “I approached Dzine-Hub to redesign my shopify store. From start to finish they have been great to work with and the end result is that I now have a great looking and well functioning store. They really know their stuff and make it easy for you. I told them what I was looking for and they designed it all for me. They are quick and accommodating for an changes I wanted to make also. There is also a page that they provide the link to where you can track the history of the changes and see how the design has progressed since the start. Which is very useful. They designed all sorts of graphics for use on the website also. There is always regular email updates and you always know what is going on. If you think your Shopify site needs a complete revamp to draw in more leads and attract more customers, we would love to work with you! Our Shopify setup experts will be more than happy to plan, develop, optimise and support you.